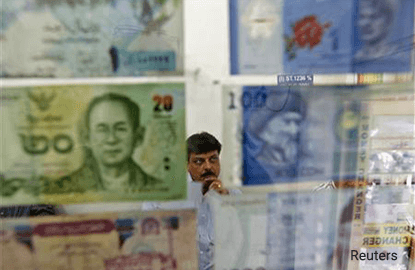 (April 6): Most emerging Asian currencies slipped on Thursday, as risk sentiment turned cautious ahead of a United States-China summit that could highlight trade tensions between the world's two largest economies. The South Korean won led the losses with a drop of 0.8%. A few other currencies also fell. The Taiwan dollar shed 0.6%, while the Indian rupee eased 0.2%. Analysts said falls in regional equities helped weigh on Asian currencies. Ahead of a meeting between US President Donald Trump and Chinese President Xi Jinping that starts on Thursday, investors were probably trimming their positions, said Peter Chia, FX strategist for United Overseas Bank. "It makes sense for players to take profits," he said. Chia added, however, that he wasn't expecting Asian currencies to fall very sharply in the near term. "I don't think the trend is changing as of now because the political overhang is still there in the US... The political factor will still dominate in the near-term." Uncertainty over the prospects for pro-growth fiscal policies under the Trump administration has dragged down US bond yields and weighed on the US dollar this year, supporting emerging Asian currencies. The won touched a three-week low of 1,134.1 per US dollar at one point, weighed down by concerns over geopolitical risks. The won fell after Japanese Prime Minister Shinzo Abe said on Thursday that he and US President Donald Trump agreed that North Korea's latest ballistic missile launch was "a dangerous provocation and a serious threat." North Korea test-fired a ballistic missile into the sea off its east coast on Wednesday, ahead of the Trump-Xi summit.